WHY STOP Competition results and exhibition at South Station. New exhibition locations. See previous locations. 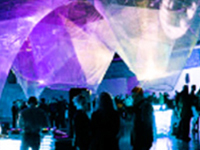 As featured on WHDH Channel 7 News, Inhabitat and MSNBC. Read more. 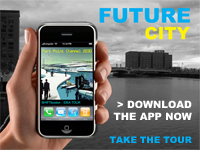 Walk through Boston's Fort Point Channel and enjoy our augmented reality tour of visions for a future Boston with your iPhone or Android phone; highlighted entries from the SHIFTboston Ideas Competition 2009. Take the tour. 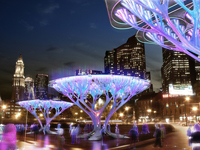 Hydra, an experimental kinetic installation using open source technology to respond to light @ Fenway's Landmark Center. Read more. WHY STOP EXHIBITION Jan 19-30. South Station. Boston, MA. Thanks to everyone who helped to make the evening a success. See more photos.